Please contact the secretariat at info@transformmeded.org if you encounter technical issues. All cancellation requests will undergo an internal LKCMedicine review and auditing process. If your request for cancellation is approved, 50% or SGD 85, whichever is lower, will be retained to recover, administrative and material costs that have already been incurred. No cancellation request is allowed after 01 October 2018. 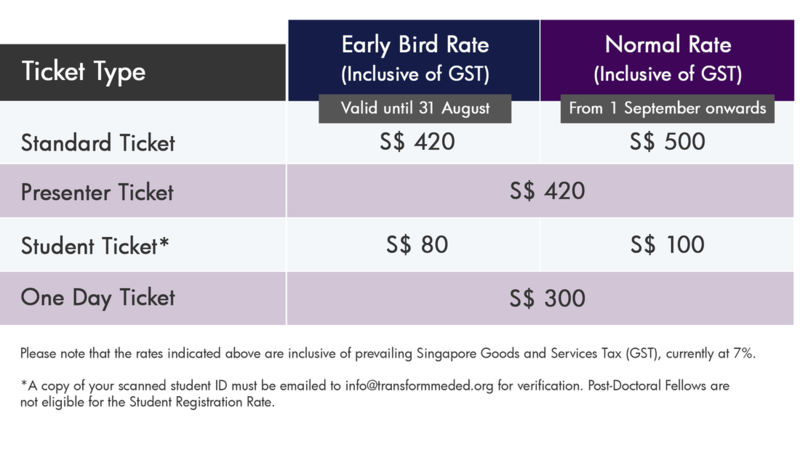 For delegates using promo code to register, the organiser reserves the right to request for payment or cancel your registration if we are unable to verify your staff/student status.